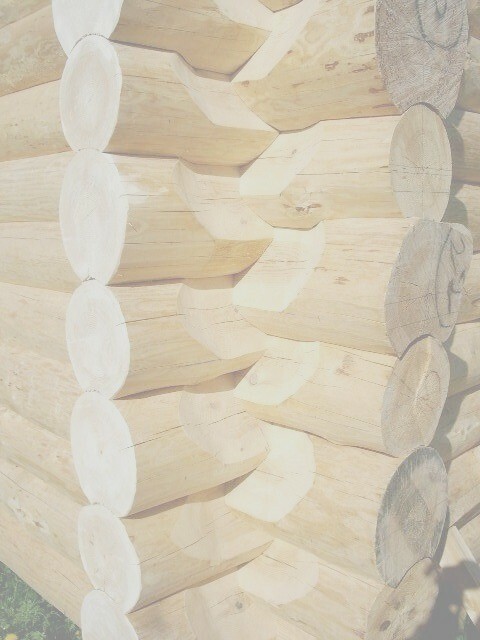 We manufacture Solid Round Timber Log Cabins, Log Homes and Holiday Log Cabins. In the UK we have found that machine rounded logs are preferred by our customers rather than the raw tapered logs. You may wonder why we can produce solid log cabins far cheaper than other suppliers in the UK who only supply small dimensional milled timber kits. The answer is very simple, we do not import imitation kits and we do not use middle men, we buy in our trees direct from sustainable managed forests and work them ourselves to produce the real thing rather than an imitation Log Cabin. This is a huge cost saving that we pass onto our customers. You also get far more for your money with one of our cabins or log homes with no hidden extras and an exceedingly long life expectancy if maintained correctly. All our cabins are made from either green tree (freshly felled tree), grown and harvested in Scotland (Mainly Ayrshire). All walls have a minimum thickness of 150 mm and with the option of 150 mm, 200 mm or 300 mm depending on the use of the cabin. We supply either cabin shells consisting of walls, joists and roof purlins/rafters or a complete house consisting of walls, floorboards, joists, roof, doors and windows. Prices for Small Holiday Cabins and Garden Cabins from 150 mm or 200 mm round log can be as little as £5,000 Ex Works and Ex VAT, but this is totally dependant on client specification and what is included in the Cabin. All builds include all necessary treatments to protect the timber. All our Log Cabins and Log Homes are Hand Made by us. An average 2/3 bedroom home, fully insulated complete with double glazing and all doors, windows, floorboards, roof etc., can cost around the £30,000 mark (and sometimes much less) Ex Works and Ex VAT. We draw up plans for all our clients and charge a nominal fee of £450 (Ex VAT) for this service which is "Time Spent" and not for the purchase of the plans, however, should the client then place an order, this amount shall be refunded by reducing the final invoice by the same amount, although ownership of the plans, copyright and design rights together with all other rights remain the sole property of The Tsarina Imperial Dacha Co Ltd and Michael Dutton - Designer. The plans include all Floor Plans, Elevations, U Value Reports for Components and a Condensation Risk Analysis. Once plans are drawn up they are submitted to the client for approval or changes, and once final approval has been made, no further changes will be accepted, unless minor. Once we have the final plans, we can then put an estimate together for the clients Log Home. Clients plans are never used for any other build which means that each and every build is unique, individual and one of a kind, this in turn adds value to the finished property. This method of building puts home ownership in the reach of all, and we can build to suit all budgets. Should you decide not to order from us after we have drawn up plans it should be noted that as Ownership, Design and Copyright of the plans remain the sole property of The Tsarina Imperial Dacha Company Ltd they cannot be reproduced, copied, modified in any way or the building constructed without our express written consent. Ordering the Cabin from us based upon our design will license you to have the Log Home or Log Cabin built for your own personal use at no additional cost. The fee for the drawing up of the plans is for "Time Spent" only and not for the purchase of the plans as these are never sold. Should you wish to use plans created by ourselves where the Design and Copyright are owned by this Company but have the Log Home or Log Cabin produced by another manufacturer, then we can license you to do this with conditions. Ownership, Design and Copyright of the plans are retained by The Tsarina Imperial Dacha Company Ltd to protect your unique building from being copied. Should we discover that someone has copied the design or copyright of the building then this would be Design and Copyright Theft which is protected under British Statute Law and we shall take whatever action is necessary to remedy this. There are many factors that must be taken into account before we can quote a price for the Log Cabin or Log Home, especially when you consider these are bespoke buildings and "NOT OFF THE SHELF KITS" . All prices quoted are Ex Works and Ex VAT. When deciding on your log cabin, one must consider location, purpose (permanent or temporary residence) general climate for area and roof finish (Wooden Shingle Tiles, Felt Shingle Tiles or Sheeting etc). Wooden Shingle Tiles, although expensive, as they are hand made, can last approx 70 years before having to be replaced. The most important factor will be the choice of foundation type, and we will be happy to discuss this with you and advise what would be best for your cabin or home. Another factor to consider is whether to have a single storey or a 1 and ½ storey cabin or home. This would utilize the roof space as a sleeping area allowing you a much larger living area. Always remember that your Log Cabin or Log Home will only be as good as the foundations that it is built on, so the foundations are one of the major factors to take into account when building. We also offer many extras for your cabin should you wish to incorporate them, and we would be happy to discuss them with you. We also build children's log playhouse cabins, play equipment and bespoke Garden Furniture from round log. So if you are looking for a family cabin, why not compliment it with added facilities for your children. Our prices vary according to cabin size, purpose of cabin (Permanent or Temporary Residence), number of windows/doors, internal log walls, roof material and final finishing and extras as per customer requirements. We would be happy to discuss your needs with you and recommend what would be the most suitable cabin to satisfy these needs and then furnish you wish a quote for your dream Log Cabin or Log Home. We can also offer training courses in Log Building from machine rounded logs for persons who are interested. Courses can be adapted to suit individual needs. please feel free to contact us to discuss further.